The penultimate podcast is revealed… And it is our networks best success story yet. 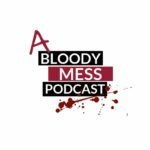 A Bloody Mess joined our family a few months back and with the first two episodes soaring in listens it became apparent very quickly that Chen and Jim’s brand of true crime was a hit. Episodes 1 and 2 are a two part series on HH Holmes, a fantasist nutter who embarked on one of the most surreal killing sprees known to man after moving to Chicago..
Chicago you say.. I have an interesting fact about Chicago.. their NFL team, The Bears, just managed to win their division for the first time in 8 years.. Early into their podcasting journey Chen and Jim have brilliantly combined the horrific stories with humour and an excellent psychological insight due to them both being students of psychology from University, where they met, helping to bring theories into the events of the featured killers around their motivations for these horrible crimes. University you say! – I have an interesting fact about University.. this is where Mike Wazowski and James P “Sully” Sullivan first met to learn how to scare kids. Having listened to only one other true crime podcast before this – Which Murderer, featured on day 7, I was astounded by the effort created in scripting each episode and it is clear they have put in a mighty amount of research into each episode. Sneaky peek for those reading today (Christmas Eve) – a Christmas Special is being released tomorrow! Go and subscribe to their podcast here.